The Track the Vote program sought to answer questions about the effectiveness of nonprofit service providers in promoting voter participation within their regular services and programs, as well as their potential for increasing voter turnout among nonprofit clients and constituents. To do so, the program tracked 33,741 individuals who registered to vote or signed a pledge to vote at 94 nonprofits. The nonprofits included a diverse set of community health centers, family service agencies, multi-service organizations, and community development groups across seven states. 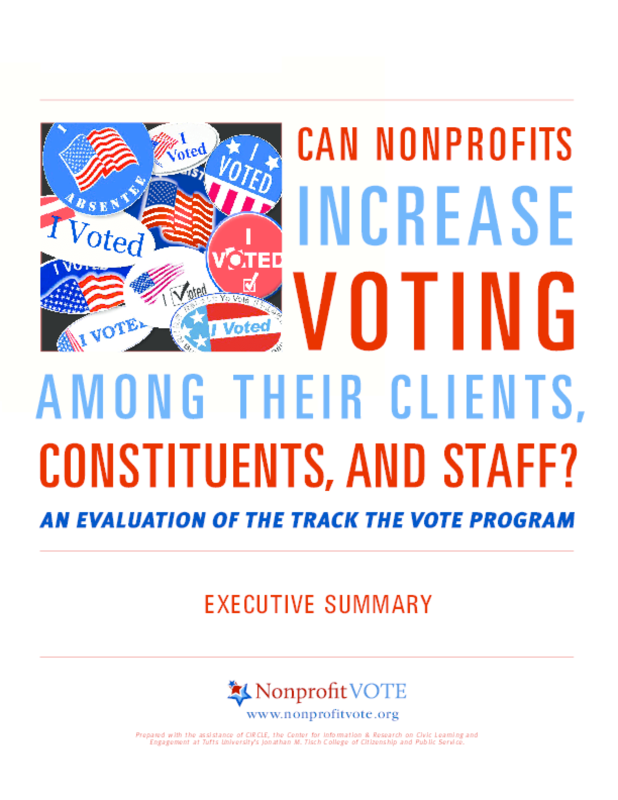 Using demographic and voting history data, this report determines who the nonprofits reached and at what rate contacted voters turned out to vote in the 2012 general election, as compared to all registered voters in the seven states involved. The results showed the impact of personal voter outreach by nonprofit service providers in raising turnout rates among those least expected to vote and in closing gaps in voter participation across all demographics. To complement the voter turnout information, standardized interviews were conducted with 27 of the participating nonprofits to learn more about the capacity issues they faced and the tactics they used to engage voters. Fifteen of those interviews were turned into case studies, contained in Part II of this report.